Christmas is ever nearing... What have you asked Santa for? Well we all know it's not long till the big day; and I assume we are all taking full advantage to get something we really want or need. What has everyone treated them selves to or asked for? Sorry to put a dampener on things lol, I'm sure they'll serve you well for a fair while. Apparently, JD Airsoft will be getting them back in stock some time this/next week, so the second one crops up I'm buying it, along with the OD stock, since you have to buy it in black to get the trades, apparently. God i'm looking forward to Xmas! all cash will be added to the vfc 417 fund in readiness for the ukara registration ! I blew my money on a bike so I can cycle to my local skirmish site instead of taking the bus. Spec-Ops cordura wallet to replace my leather one that's gradually falling apart. Gotta be tactical day-to-day and it's proven nigh-on impossible to find a normal civvie wallet with a double transparency so I can have my mil ID on one side and my driving licence on the other as well as a zipped pouch for coins. Guns: Systema M4 CQBR (2011 MAX II with tac's mods), magpul M4, KJ GBB M4 CQB, KJ sig P226, MP5 (broken). 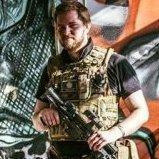 Loadouts: UK stuff (SF, SFSG, MTP). Got a set of genuine US Marine marpat kit for shits and giggles though. Sites: As many as possible in the SW! Who's with me? I'm serious. And a gaming PC that goes like sh*t through a goose! He dont tend to stop at my house, but I just treated myself to a TM & Systema 733 commando /w m203, if that counts? However, on the 28th I'm ordering an M870 shotgun, an LCT AK104 conversion kit, an MP5 and maybe an RPK. Also considering buying a couple of dozen magazines and general accessories for all my existing kit, some camo and a RICAS. Not much at all then, eh Finius? The adaptor that comes with the RIS allegedly fits the ICS with a little bit of filing, Craig. So long as it's the Madbull replica, as the genuine RIS doesn't fit without filing a huge amount of the gas block off, or so I've heard. I personally just bought the adaptor and I've not tried using the adaptor supplied, but you could always just try anyway. I know how you feel Craig! My sister is always stealing my tools too! Oh I would even mind that, once shes taken them they're now hers... If I ask for it back I can only borrow it, and in the rare event I get anything back its so filthy I can't use it when I need it lol. I've been promised some stuff off this list, but I ended up borrowing some dosh to get the boots ordered the other day because Millets dropped them to GBP45. I mean Merrell boots for GBP45, ffs!